If you have not followed me for a while, or are not a local you might not know about the troubles that the Rochester Diocese has been through in the last few decades. It has to be incredibly hard to be the bishop of a decent size Diocese, and especially one inn such a liberal area. Having said that, our previous bishop made some very questionable choices during his time in office. He even when so far as to detail some of them in his book, even saying that some of the things he was doing were against Church teachings. 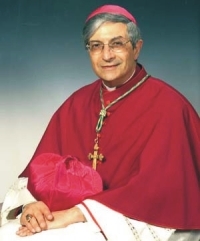 Thankfully that Bishop has retired now, and the new Bishop has been put in place, The Most Reverend Salvatore R. Matano. Very recently (last week in fact,) it was announced that at least one of the changes made by the previous bishop has been reversed, lay men and women will no longer be giving homilies So there is some real hope that things will start to get back to the way they should be. That being said, it is always nice to have a chance to meet the man himself. This weekend he surprised one of the parishes that we have been frequenting lately, with a visit to celebrate the installation of a new pastor. I have to say, it was a thrill to see him in person, and to watch him celebrate Mass. The little details like during the procession, he took the time to walk to the rear of the church where there tabernacle is, and kneel before it, before he went up on the altar, and preforming the entire Mass himself instead of delegating the duties to the three other priests and two Deacons who were there, made all the difference in letting us know who he really is. After Mass two really nice things happened. First, there was a brand new priest there. He is actually the son of one of the other NFP teaching couples in the area. As I was saying, after Mass our second son went up to talk to him, and before it was over, the new priest had given him a blessing. It turns out that it was the very first time he had ever given a blessing, so that was really neat. The second one was that the bishop stayed after Mass and met with everyone who wanted to talk to him. He talked to the kids, blessed the family and even my wife and the new little one. He talked to the kids about laundry, told them he does his laundry on Sunday afternoon, and asked them if they did their own laundry. Believe it or not, being able to talk to the kids about something so intergral to our lives meant a lot. You would expect someone who has gotten to the level of Bishop to be able to give a good homily. Though I’ve seen some who really don’t. This was not the case for our new Bishop. He gave a very good homily, and I very much enjoyed hearing him talking about how we can’t separate ourselves from the world, instead how we must learn to live in it while keeping our Christianity. He talked about heeding the call to do what is being asked of us by God. He used himself and the new pastor as practical examples, saying both of them were happy, where they were. But when The Pope asked him to move to Rochester, and in turn he ask our new pastor to move to this parish, even though they had been happy with where they were, the came and they will serve in their new roles as they best they can. In short, it was a very nice treat to have the Bishop show up for Mass.